Seven students graduating this year on the MEng Electronic Engineering and MEng Computer Systems Engineering have designed and built an electric train for the Llanberis Railway (Rheilffordd Llyn Padarn) as part of their degree studies. All MEng students take a substantial team project in their final year in partnership with an external company. This year’s partner company was Rheilffordd Llyn Padarn. 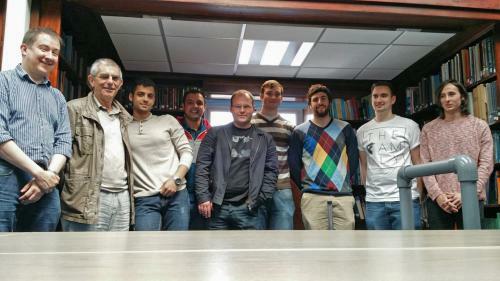 From left to right in the picture: Dr Iestyn Pierce (project supervisor), Dr Osborn Jones (Rheilffordd Llyn Padarn, external supervisor), Hazem Al-sheikh, Amaid Anjum, Marek Rebalski, Mac Jones, Jack Brady, Ieuan Gough, Lewis Hunt. This year’s project was seen—and ridden—by hundreds of visitors at the first “Gŵyl Ynni Plant” a festival of energy generation, storage and utilization on 19th and 20th of June.